Update: Apple has confirmed Siri’s breaking news (and that WWDC will trade off between Bill Graham Civic Center and Moscone West this year), and has opened registration to developers. You’ll have until April 22, with Apple picking attendees by lottery. Good luck! If you as Siri when WWDC is, she’ll tell you: it’s June 13 through 17 in San Francisco. 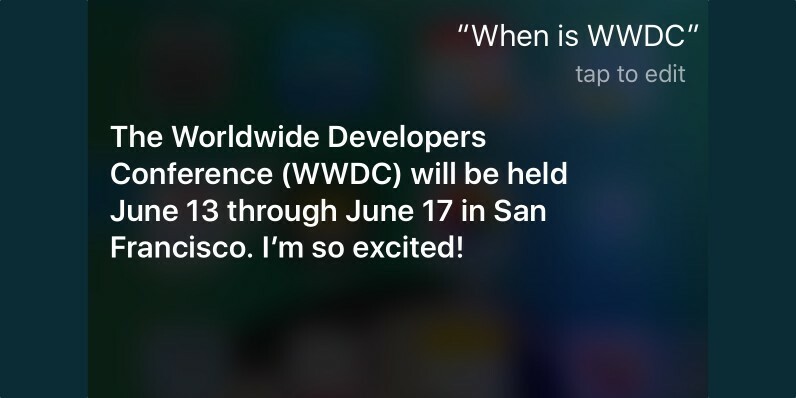 What Siri doesn’t say is where WWDC will be, but the prevailing wisdom is that it will again hit Moscone West, especially since its calendar is wide open that week. Siri is staying mum about what’s coming, too. I asked her what would be announced, and she gave me nothing. She did tell me to check Apple’s website for more info, like I’m not there enough as-is. Apple fans should expect some talk on iOS and OS X (or MacOS? ), and rumors suggest there will be new MacBooks and perhaps a new Apple Watch coming as well. WWDC is always packed with good stuff, so we’re looking forward to June.